Thus far its been a confusing spring. Late to start and lingeringly cold with the odd day of unseasonable heat, its been downright disorienting to me. It is not as though I’m averse to the new and unusual but, I do look forward to the reassuring rhythm of the seasons. The unfolding of the seasons is the backdrop to my activities. I like knowing what to expect when. 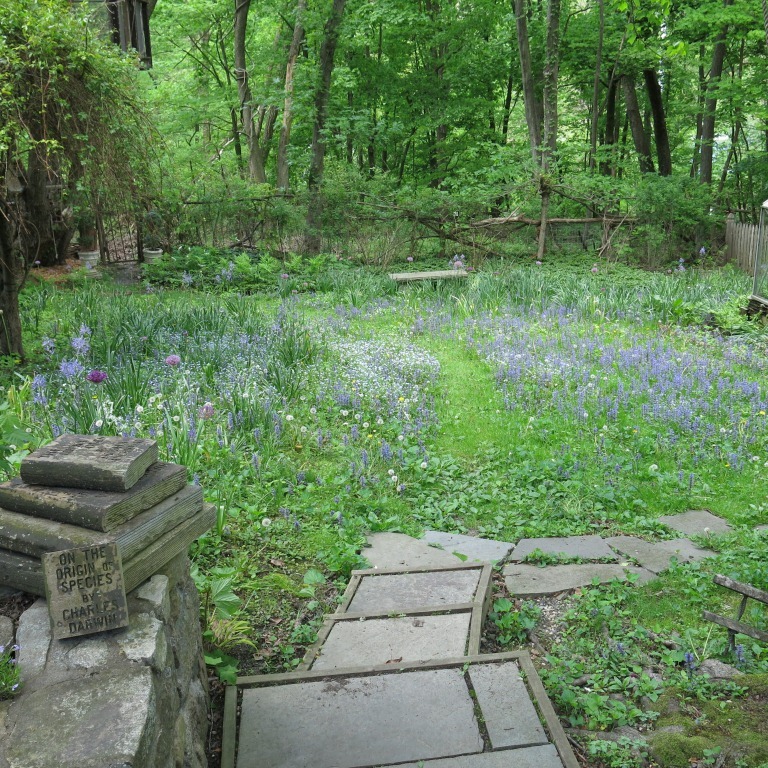 Like lily-of-the-valley in early to mid May, early peonies and roses for Memorial Day, lilacs in bloom for Mothers Day, dogwoods for Fathers Day and so forth. Not this year. Matters are a bit topsy-turvy. 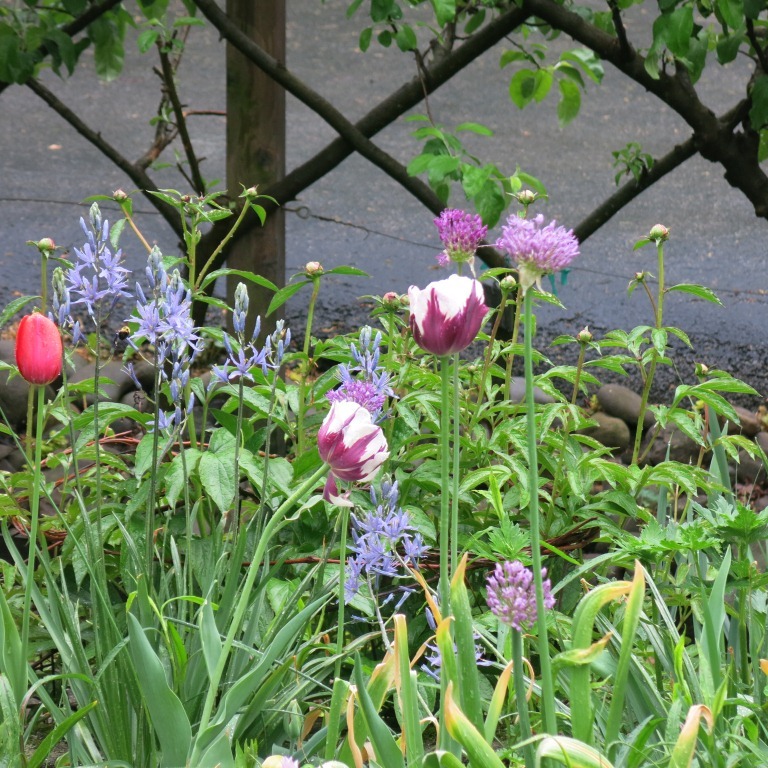 I didn’t mind that the tulips began a little late because they then lingered long enough to hangout with the alliums and camassias. 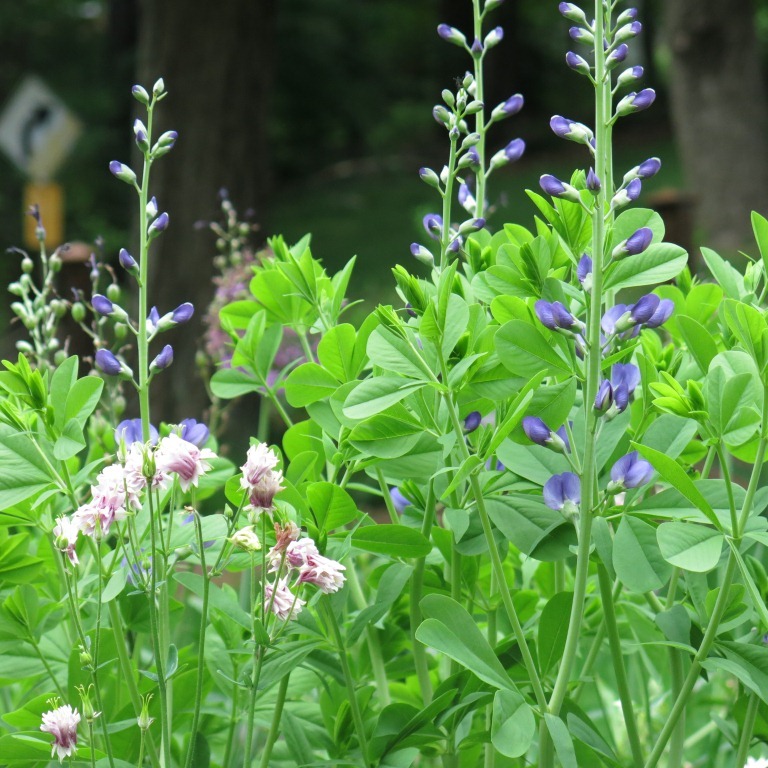 But where were the baptisia and amsonia to bring their blues into the palette? The roses should be making their debut by now; so what happened? Meanwhile, the dogwoods in my neighborhood have long finished blooming. Its disconcerting to say the least. Even more bizarre was the firefly that flitted around inside my house last night. Out of place and time. This has me totally perplexed. As we confront climate change, there is certainly going to be much to adjust, discover and learn anew. The one tree peony in my garden usually has top heavy flowers in early May. This year, its only just in bloom. 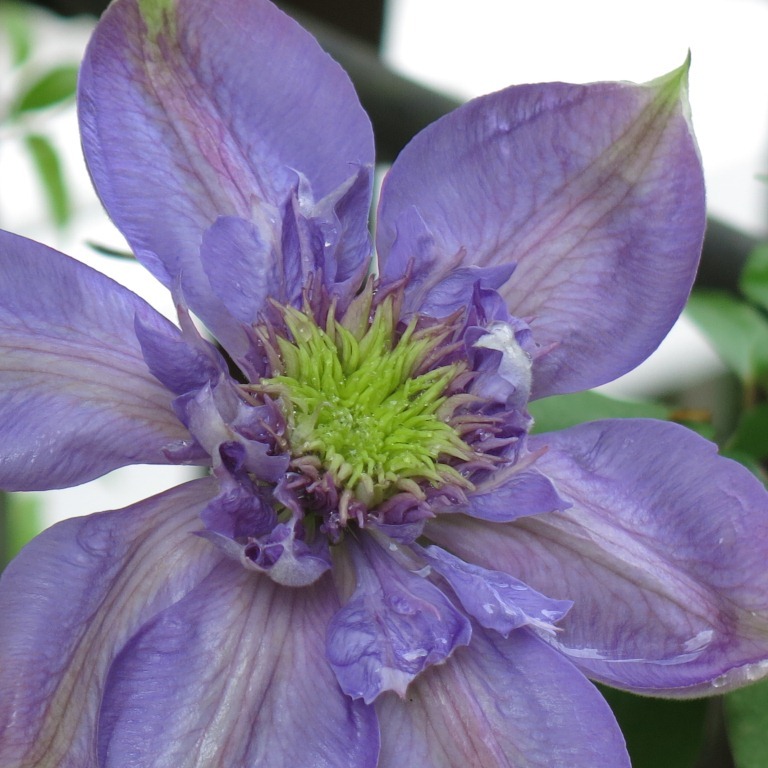 Because they are weighty double petaled beauties, they hang down. The best way to gaze at their magnificence is to cut them and bring them indoors. The added bonus is that they have a spicy fragrance that greets me each time I pass them them by. Makes me pause and take notice which is just enough to remind me to breathe, relax my body and then carry on with the daily busy-ness. 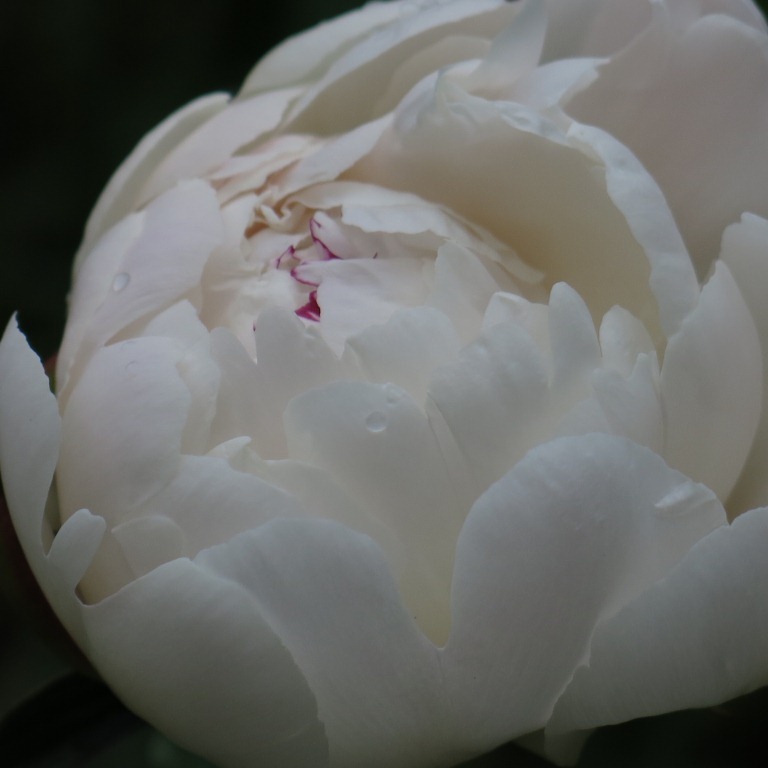 This plant , which I think is a Paeonia ‘Hakuo-Jisi or a ‘Souvenir de Maxime Cornu’, was a gift from Henriette Suhr of Rocky Hills. 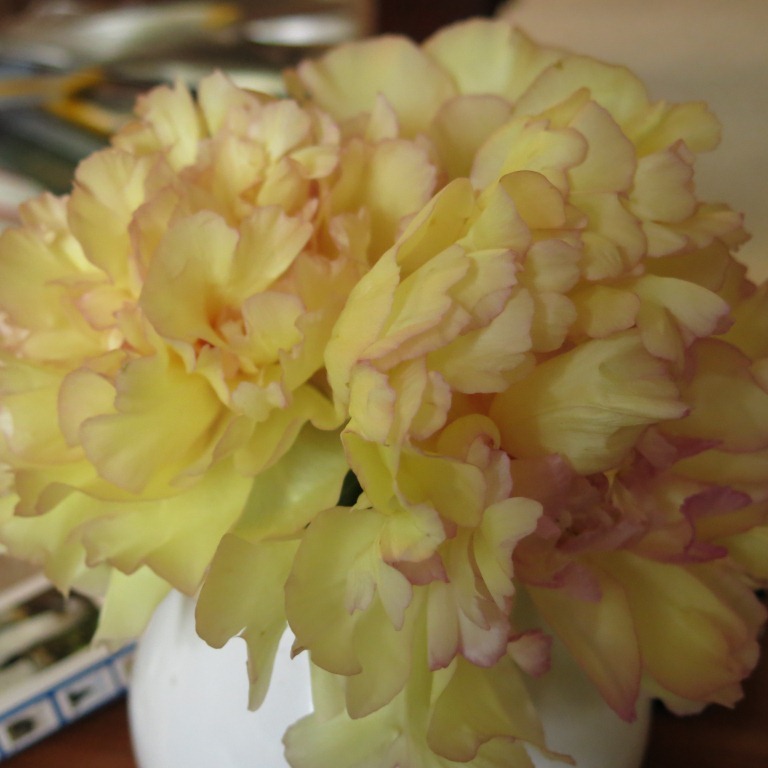 So its compelling call to literally “smell the peony” always reminds me of our cherished friendship. A majority of the hydrangea did not leaf out on their stems as they normally do. 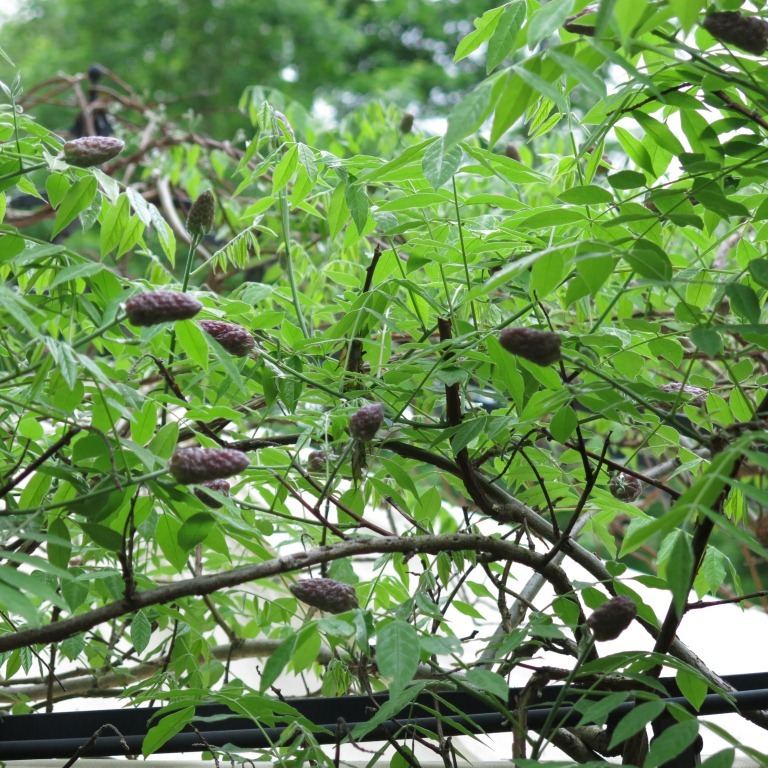 Instead, leaves have emerged from the base of the shrub while the limbs have remained looking like dry sticks. I think the severe, long winter affected the stems but the roots were still strong. The new growth should come up nicely and all is not lost. I’ve cut back all the old, leafless stems. It’ll be interesting to see if these hydrangea bloom this year. I have sadly lost a few other shrubs that did not do as well as the hydrangea. If they will be replaced by the same type or something completely different is yet to be determined. I think a graceful period of mourning is in order. The good news is that, for the most part, the plants are all coming up well. However slowly. 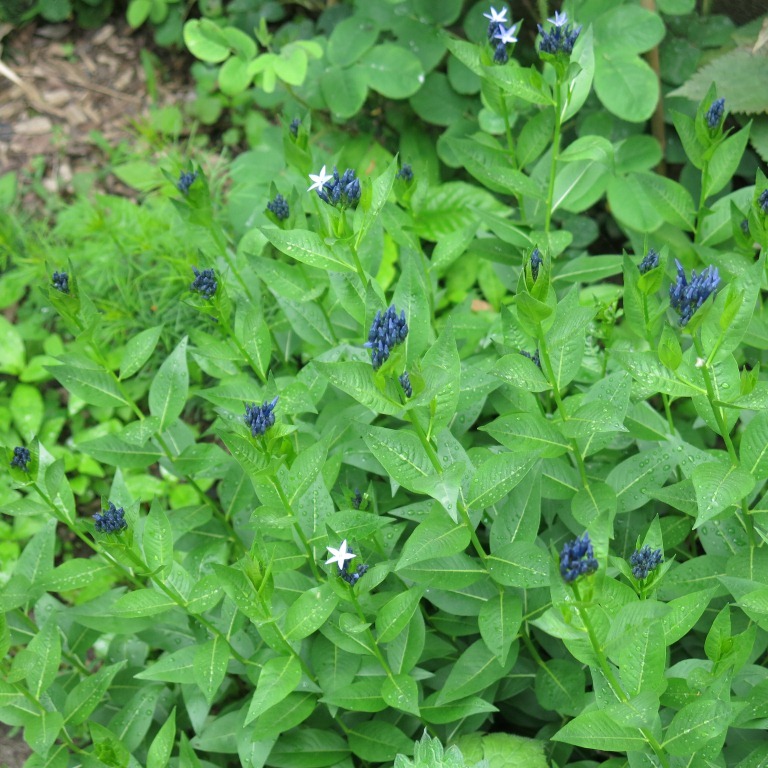 The amsonia and baptisia are just beginning to display their moody blues. The roses have lots of buds so I’m guessing they will open in another week or so. The early peonies have begun their frothy show. 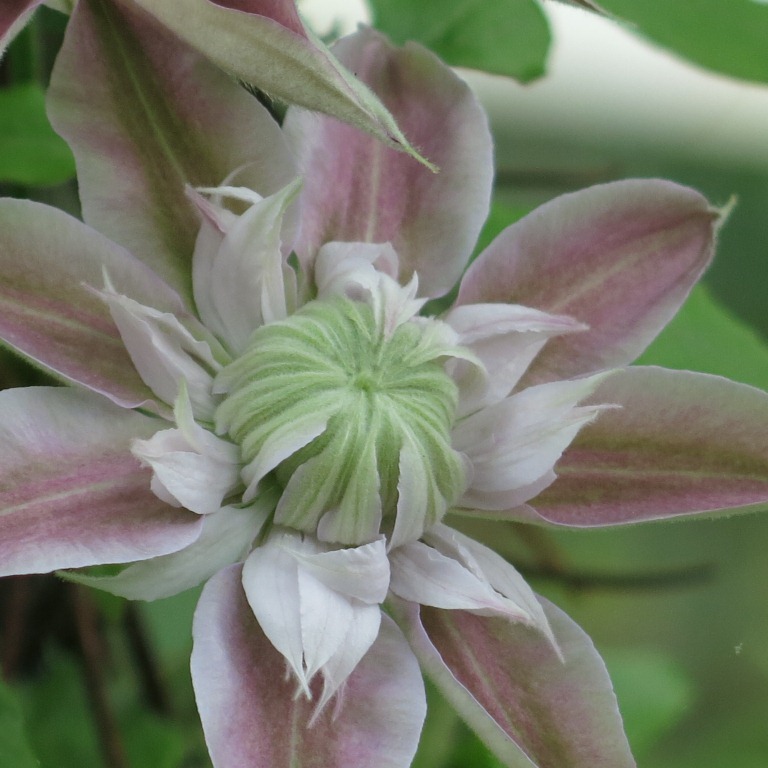 And the clematis! They look particularly fetching this year. 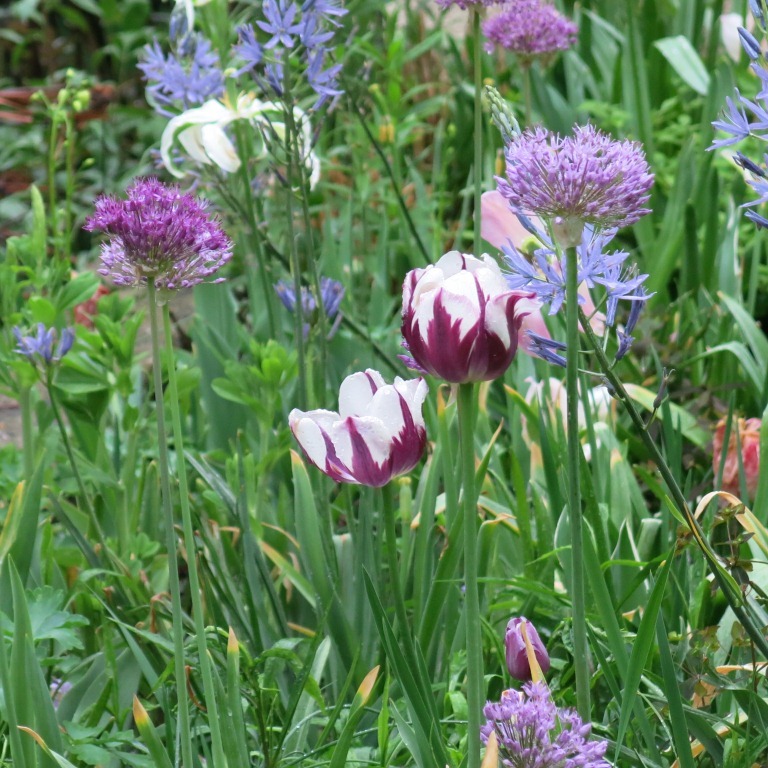 The alliums have lasted longer than usual in both the perennial beds as well as the meadow so, I cannot complain. There are even a couple of tulips still going strong – as though reluctant to leave the party. The American wisteria is bud heavy and as always, I’m giddy with anticipation. I’m keeping my fingers crossed that the weather does not heat up too soon. This would do in the buds and there’ll be a very sorry performance. No ticket reimbursement for this one. I’m once again enjoying the pleasure of picking salad greens from the potager and serving up a delicious melange of lettuces, baby spinach, arugula and mustard greens with a sprinkling of chopped fennel and parsley. With toasted nuts, sliced strawberries, shavings of Parmesan and a balsamic dressing, its the perfect lunch to celebrate the season. Add a glass of crisp white and its a special event. In the end, despite the not so normal pattern of growth in the garden, I’m learning to simply enjoy what unfolds. To be present for whatever reveals itself and learn to appreciate the new combinations of color that are really quite lovely. There is change afoot for sure. Perhaps its natures way of reminding me that She is the ultimate artist, gardener and teacher. I stand humbled. Buds in waiting. American wiisteria. The frothy splendor of my tree peony. As usual wonderful column and pictures. Everything is topsy turvy. And yet still beautiful. Did you really see a firefly? I thought I did the other night but dismissed it as an optical illusion. They are my favorites but it’s too early. Have seen hummingbirds for a few weeks which seems odd too.